Idea, exhibit, interaction : what's poetry? Although I expect to return to this work, nothing is happening at the moment. I’m hoping to tour some of the work to other festivals and galleries, but my first investigations suggest this will take a long time to get going. Can’t really answer that question, just yet. We took down the exhibition today. It was a lot quicker than setting it up. And now Bank Street is festooned with the beginnings of a new set of exhibitions, part of the “Over to You” mini-festival of art. I walked around the exhibitions-in-the-making tonight, before a reading (by Simon Armitage, Sally Baker, Liz Cashdan, Jenny King and Beverley Nadin, who were all excellent, but I think the stars were probably Simon and Bev. Simon was launching his new pamphlet “The Motorway Service Station as a Destination in its Own Right”, published by Smith/Doorstop, which is the Poetry Business’s publishing arm; and Bev was accepted her righteous and rightful prize as TPB Sheffield Poet prize – she is pretty clearly going to go places, I think). Anyway, some interesting exhibitions in the offing – but none of them mine. I suddenly plunged into depression that the place which had been pretty much my life for a month – certainly occupied most of my waking thoughts and much of my time – suddenly wasn’t my place any more. “My” spaces were occupied by alien objects. This is not something I’ve experienced before. I guess the closest feeling is when you visit a house you used to live in: an odd combination of the entirely familiar and the completely changed. In fact, my Residency continues, which is good news. But, of course, all its immediate energy is Prospero’d into thin air, and I’ve no clear project to be working on any more. I do have, of course, dozens of ideas which spin out of the work so far, but none are in place, and perhaps I need a rest from all this for a while. And it isn’t quite over, in any case, as I still have to produce an evaluation for ACE and deliver another 100 CDs. – personally, I would like to see more readings at Bank St. But who will organise them? – I’d also like to read more myself, but I’m not sure what opportunities I might find now. – I want a new audio project. “Speakers” was exciting, challenging and, I think, a pretty good piece of work in the end. I now want to do something better – perhaps something a little more musical. – the digital poems are interesting but not as effective as they could be, partly because of the unusual relationship between reading and attention which they create. I want to find a way to use this and produce more fluid digital works. 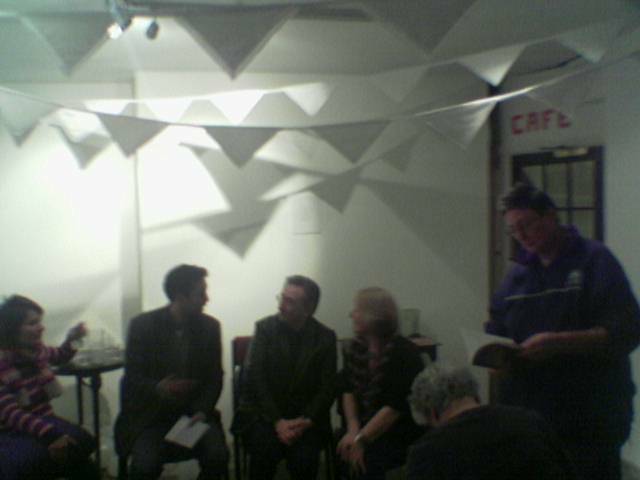 One of these was the reading by the Tuesday Poets last night. At least 42 people turned up (I was unable to get a final count). Although only seven of us were able to read, because of illness and family problems, nevertheless it was an excellent session, with everyone’s poems being received well. Jenny began – the most difficult slot, I think. Although I’d laid the room out pretty well, she was still a little troubled by traffic noise – a bit of a problem in this venue in the early evening, which I hadn’t thought about. Margaret’s gentle poetry, too, was intterupted a little by traffic. But neither poet seemed particular fazed by it, and read some lovely poems. Jenny gave us some clever work. I especially like the Christmas shopping poem which finished her set. However, I think Margaret may have had the longest applause of the evening: her work, drenched in landscape, is clearly very popular. Then me: my set was split into two, to give a more balanced evening. Three poems about war in the first part, which I thought of as the grit in the delicious sandwich of Margaret’s and Cora’s more upbeat poems. Although Cora chose to begin with a ‘woman and war’ poem, too, which was a good link through to her more lyrical pieces. She is particularly fond of poems set in or inspired by Crete, and the landscapes she delivers are an interesting contrast with those of Margaret. The Mediterranean lushness enriches many of Cora’s pieces, whilst Margaret’s moorlands reek of age and darkness. Both seem rooted in their places. Then a break, in which the cakes I’d provided as celebration were wolfed down. Understandably: I’d commissioned them specially for the event, and they were freshly handmade, and delicious. Someone was extremely greedy, however, taking at least three pieces. I hope that person feels the guilt concomitant with their excess. Lisa began the second part, worried a little by her son, Dominic, who was unhappy. But Trudi, another member of the Tuesdays, but not reading tonight, kindly took him off to play whilst Lisa gave her set. Lisa’s poems are quite mixed: some light, amusing ones (the audience loved “the thong”) and some deeper, more challenging work. I think ker question and answer poem – or rather question and deflection poem – about childbirth and the perplexities of a difficult motherhood, was telling and very effective. Next was Bev, the youngest and, in several ways, the poet in our group with the most streed cred. She tries different things, comes from different directions, and is unafraid of a quirky or unfamiliar form of work. I’m sure this is one reason why she ws nominated for the Eric Gregory last year. For example, she has a poem (or two, really) which are wine reviews; very amusing, too. Then there is the poignant and insightful RSVP, which won the Sheffield Poet prize. Some great work here. Then, Fay. Fay’s work is intensely focused on the words, the language, their sound, sense and metaphorical resonance. Sometimes she creates intensely sensual pieces, sometimes pieces which are heavy with meaning and overtones. I particularly liked the way that Fay constructed her set around the theme of journeys, conceived in different ways. She ended her set with a joyful poem about death, a raterh unusual idea which worked very well. Then there was me. I’d decided on poems which seemed meaningful as a way of ending not only the reading but the exhibition, so either about people whom I felt had contributed, or about the nature of poetry itself (and in one fortuitous case, both of these). They weren’t perhaps all my best poems, but they seemed to me to go down well, and I received a really satisfying round of applause at the end, and some very pleasant comments on my performance afterwards, someone even going so far as to claim I had “presence”, which was very gratifying. This was a wonderful event for me, and a fitting finale, not merely for the way it went, but also because of the form it took, for there were some very old friends in the audience, two couples whom I had not seen for years, andthere were also several people who had contributed in one way or another to the exhibition, so the whole event was collaborative and friendly. It felt right. Well, it’s March 6th, so “Exploding Poetry” is no more. We’ll be taking it all down on Monday. No more Garden of Stones. No more Speakers. No more Poetry Lounge. The White Space will be filled and the poet no longer have any office. The last day has been quite fun, a good emblem of the exhibition as a whole: some visits by people I knew, some by people I’d never met before’ a couple of hesitant contributions for the whole, some strong adjectives in praise of the event; people wanting something like it to continue; some bursting balloons; some new poems in the stones; a long conversation about the nature of poetry, the nervousness of poets, the terrors of performance, the need to be honest and authentic. But the best parts of the day were visits by two young ladies, Leah, who is 7 and Mila who was probably a little younger, just learning to write properly. Both of them did beautiful jobs. Mila gave me a poem with a drawing, the only visitor in the entire exhibition to do so. Leah made a poem in stones, a poem from the words of burst balloons, and a poem from the dice that went on the walls. For someone of her age, the brilliance of her work and the enthusiasm she showed for the task, would be a good model for many a grown-up writer. It was wonderful to see the work of those two poets. Although I’ve been overwhelmed by success of the exhibition: we’ve had well over 420 visitors, some have returned, many have made a point of giving excellent and flattering feedback, something like 60 to 80 poems have been contributed for it or during it, both the readings I organised were really successful: big, attentive, rewarding and rewarded audiences. I may never get the chance for anything like this again. Who knows? It has been an incredible month, and a pretty astounding year that’s led up to it. I am very lucky to have had the chance, very pleased at the success, amazed by the opportunities and learning it has given me, and think both my work and my understanding is so much better as a result. Of course, I still don’t have the published collection which was the aim right at the beginning, but I do have seventy poems I didn’t have before, and a couple of them have found publication or a prize, so I can’t really complain, can I? I hope to keep working at Bank Street, perhaps supporting other poets and writers, and perhaps collaborating with other artists there, which I’ve now got a taste for. So perhaps I’ll see you there. 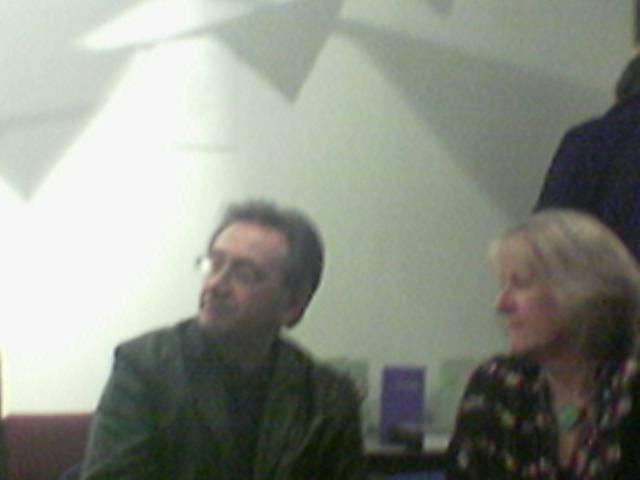 Strictly speaking, this event wasn’t part of my exhibition, as it was organised by The Poetry Business and Sheffield University. But it was held at Bank Street, in the heart of the exhibition, which we ran on until the reading began, and so most of the audience had the chance to wander round and comment on what they found. The readings themselves were good – a huge range of different material, though. 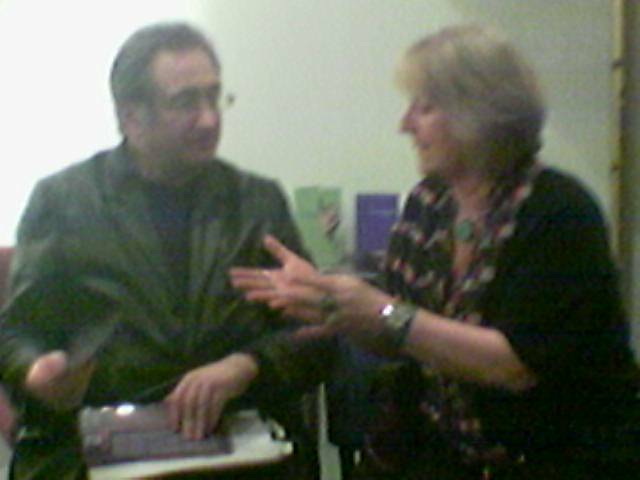 George Szirtes himself offered several different kinds of text, almost all of which were driven by some appealing formal or structural consideration (such as responding to a blacked-out postcard, or interpreting a partly obscured text) as well as being interesting as poems in their own right. The other two poets were new to me. At least, I had heard Nathan Hamilton once before, in an open mike session, but am not familiar with his work generally. And Agnes Lehockzy was unknown to me. Both are worth watching for. Nathan’s highlight was probably the reading of most of his pieces from an Ipad – in discussion later he said he used it almost exclusively for composition now, as it was so convenient (but obviously not that convenient for getting the work onto paper – this would permanently worry me if the only version of my work was in e-form). His “Malcolm” poems are disturbing, quirky, amusing and sharp by turn. Agnes (Aggie) on the other hand, offered us long, descriptive semi-narrative pieces, quite unusual to hear in a reading which, though perhaps a little difficult to keep focused on, were full of observed detail which she then suddenly or subtly takes in odd directions. The evening ended with a discussion of poetry, publication and, in its most lively moments, the place of electronic media and its impact on the poetry industry. George said he had absolutely no fears for poetry, as it would last whilst humanity did, as a fundamental need. This prompted huge murmurs of assent from the audience, which is about the closest poets ever get to a rousing cheer. Ann suggested, she thought subversively (but actually not) that poetry was not about publication, but about satisfying one’s own needs in practising a difficult art; and that books would not disappear, because of their satisfaction as objects. She’s absolutely right on both counts. All this blogging is a great way to get information out, and maybe to get known. However, we could live without computers. How could we live without books? Fifty visitors in a day! I only spent the first hour of Saturday at Bank Street, showing my best and one of my oldest – er – most long-standing – friends around the exhibition. He really got into the swing of things and left a poem for the wall, as well as a mischievous piece in the visitor’s book. Then we left for York, my prize, my reading and, it turned out, a dislocated finger. But in my absence it seems the exhibition was inundated with visitors. Over 50, I was told, and mainly in family groups. And groups who left traces of themselves, too: poems in stones, on walls, in books, on the whiteboard. As much interaction and use of the materials as in the first, private view. Clearly some message had gone out somewhere, but I’ve no idea what went where. My best guess is that a message to the education department of the local authority had reached schools, and from there, kids and parents. But who knows? If you do (perhaps you visited on Saturday) I’d really like to know what drew in all these visitors. Not so many today, though. However, Michael and I came along, and left behind us 40 copies of the CD, hot off the presses, ready to leap into people’s pockets at a mere £5 a time. It does look, and sound, good – but there’s no telling if any will sell. And, whilst I’m here, let me just remind you that the Tuesday Poets are reading as the finale of the exhibition at Bank St on Friday, 5th March, 6.15-8.00. There’s a bar (wine, £1) and free cake, as well as tea, coffee etc.